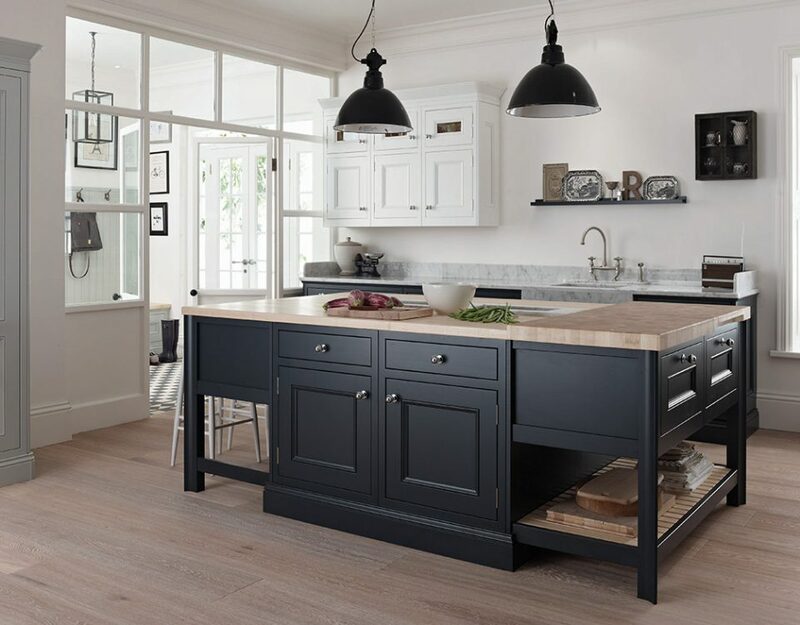 A fine example of a Broadway bespoke in-frame kitchen in 3 tones, which tastefully ‘fuses’ Edwardian traditional and contemporary shaker styling. 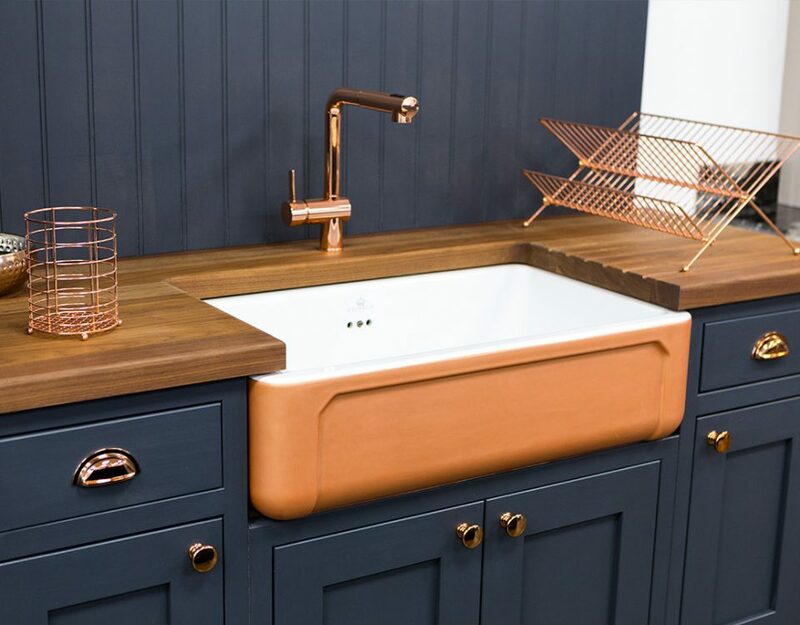 A lighter, simplified approach complemented by streamlined, plain edged worktops and flat, pastel paint finishes and modern accessories and equipment. 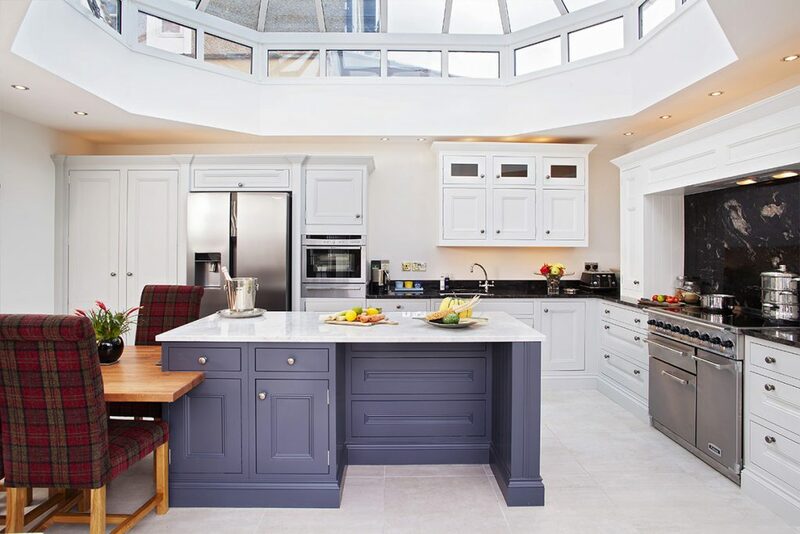 An Essex ‘Arts and Crafts” Home with the Perfect Edwardian-style Kitchen. 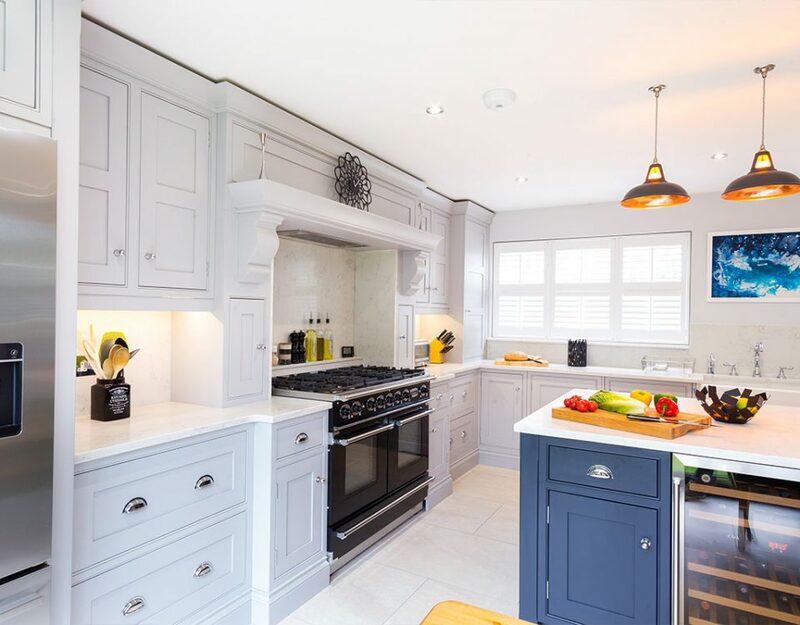 Lorraine Jones wanted a kitchen with classical tones but light in feel for her 1930’s, 4-bedroomed Essex home; a home she shares with her husband John and teenage daughter Erica. The simplistic, yet pleasing, architectural style of the Jones ‘Arts & Crafts’ house cried out for a traditional kitchen but with simplified lines and form, to be in tune with the light and simplistic architectural style of the homes’ interior. The interior design that Lorraine has created elsewhere in the home successfully blends her contemporary styling tastes with the subtle, period architectural features of the building. 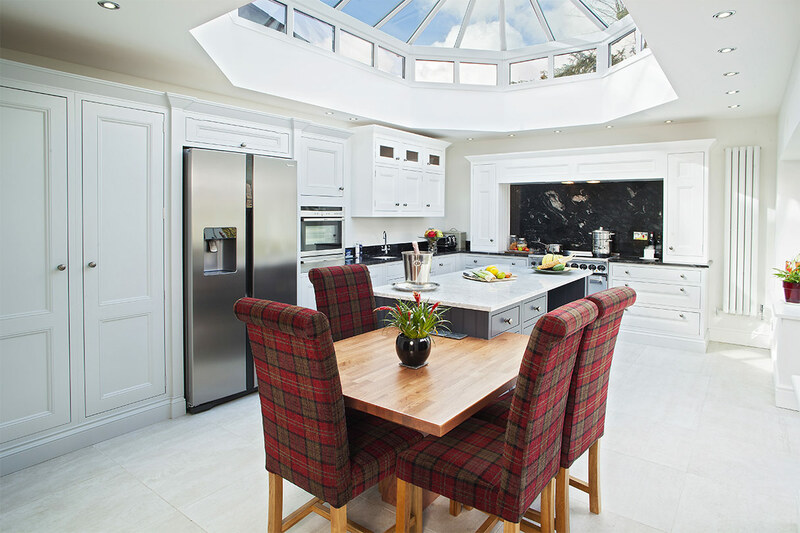 Working with Lorraine, this is the style that Broadway Kitchens wished to emulate for the open plan, conservatory kitchen; continuing the home’s interior design flow. Working with handmade Shaker-style cabinetry, a very pure, in-frame kitchen design was created and hand-painted in three beautiful complementary colour shades. 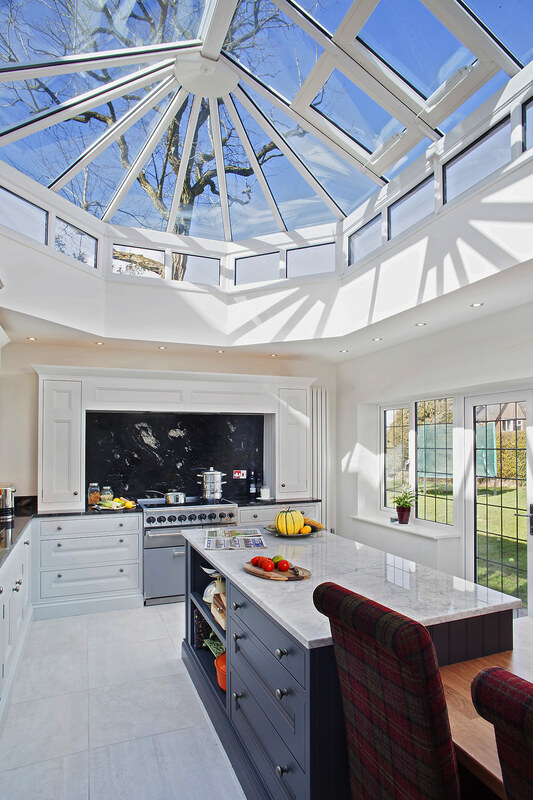 Directly below the conservatory’s orangery style, glazed ceiling and adjacent to the French style doors which open directly onto the garden, is a multi-function island. The island provides informal dining in the form of a breakfast bar, where one can simply swivel round and take in the views of the garden, as well as an integrated natural oak table set at a lower height. This table is capable of seating four in comfort. The island is as practical as it is beautiful. 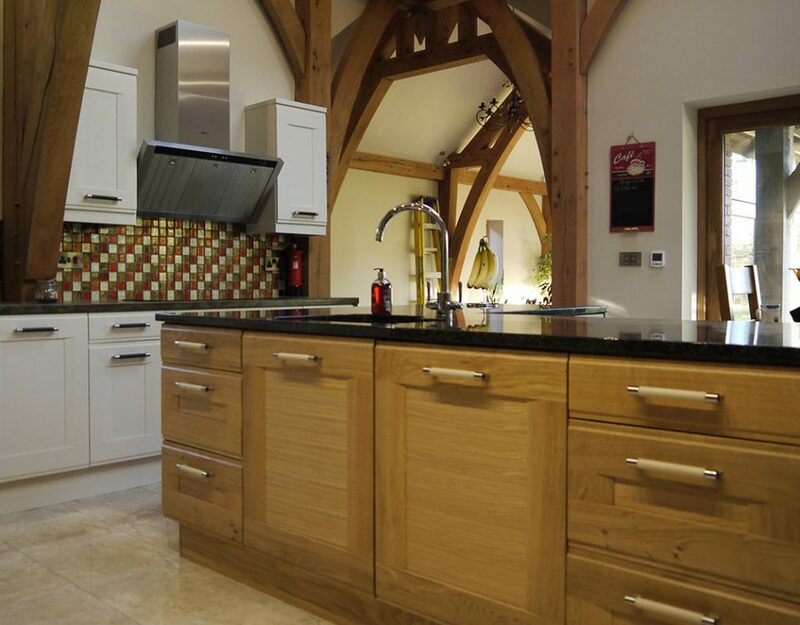 Plenty of storage has been provided with cupboards, oak dovetailed drawers and shelves for such things as cookery books. Whilst the vast expanse of Carrera marble worktop provides plenty of food preparation surface as well as a pleasing contrast to the ‘Charcoal’, hand-painted finish of the kitchen island. Visually pleasing, contrasting finishes are echoed with the wall furniture. 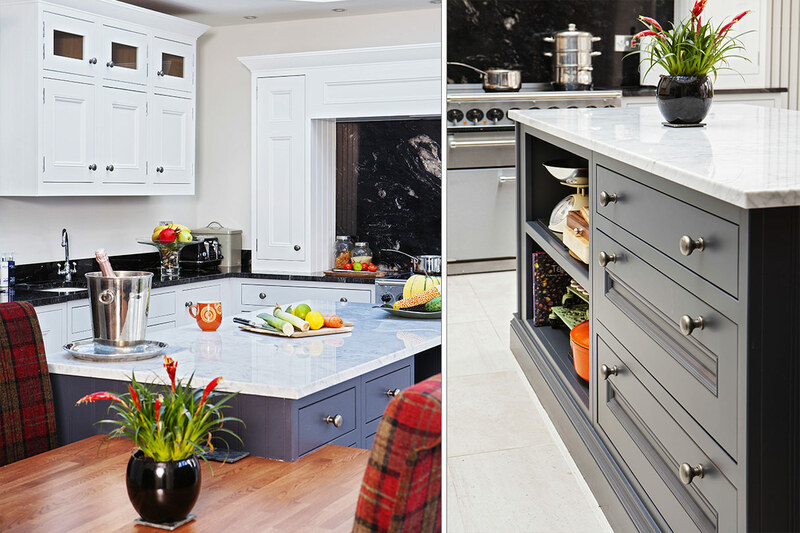 The hand-painted, ‘Dove Grey’ base cabinets work wonderfully with the ‘Cosmic Black’ granite worktops. Once again, practicality has been at the forefront of this design, since the base and tower cabinet arrangement provides the perfect working triangle. 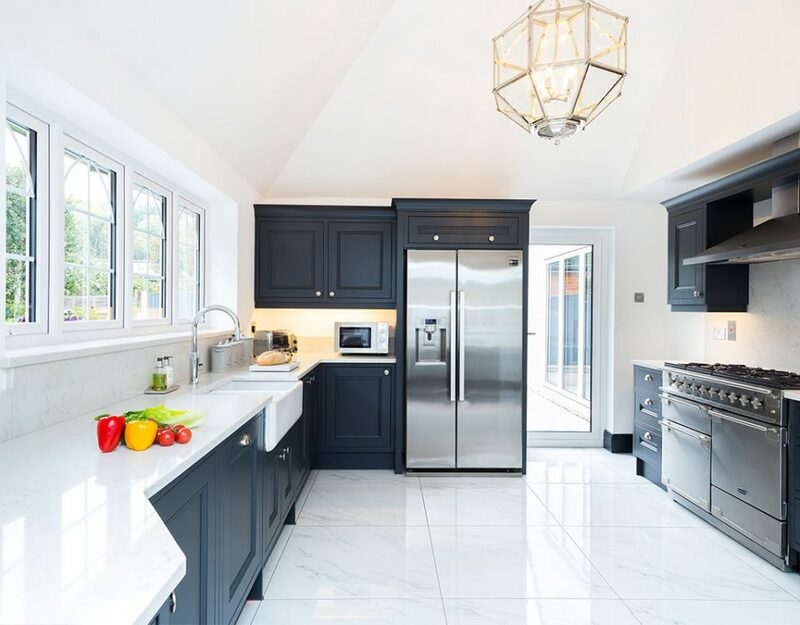 For example, the large double door larder unit, big enough to act as a food and food ingredient store for the entire family, sits next to the large ‘American’ style fridge freezer which in turn is next to the integrated ovens, warming drawer and kitchen sink. On the opposite side of the sink and on the return wall is a stainless steel, free-standing range cooker with an ultra-efficient, induction hob. 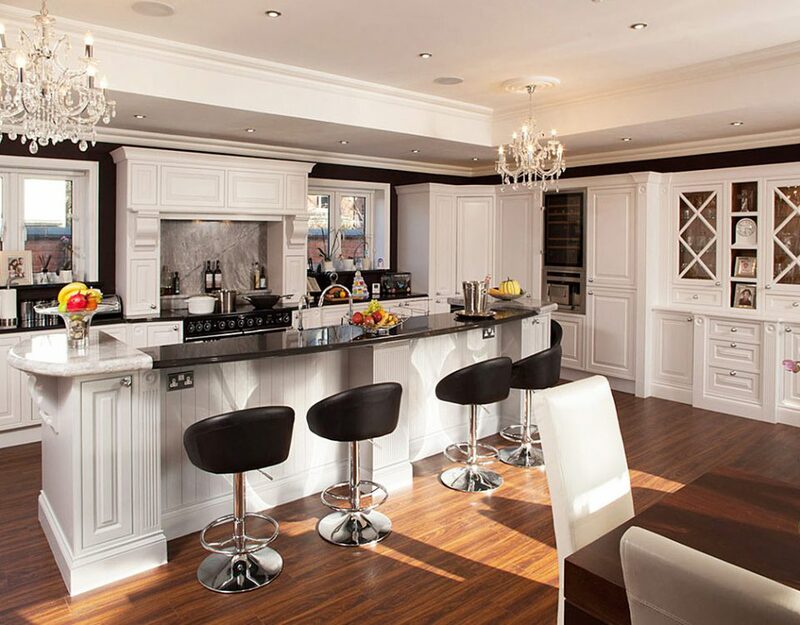 As you stand with your back to the open-plan living room opening and look through the kitchen, your eyes are immediately drawn to the wonderful island then beyond to the impressively long mantel, framing the range cooker and additional drawer storage; handy for any utensils the cook might require. Painted in ‘All White’ as with the partially glazed wall cabinets, the finish gives a step lighter, tonal change from the base cabinets; this somehow helps to define the mantel. Lorraine sums up the end result perfectly “I love how Broadway’s designer, Satt, was able to work the shape of the room, producing custom-made furniture that’s beautifully in proportion with the architectural shape and dimensions; I don’t think ‘off-the-shelf’ furniture would have worked nearly as well. 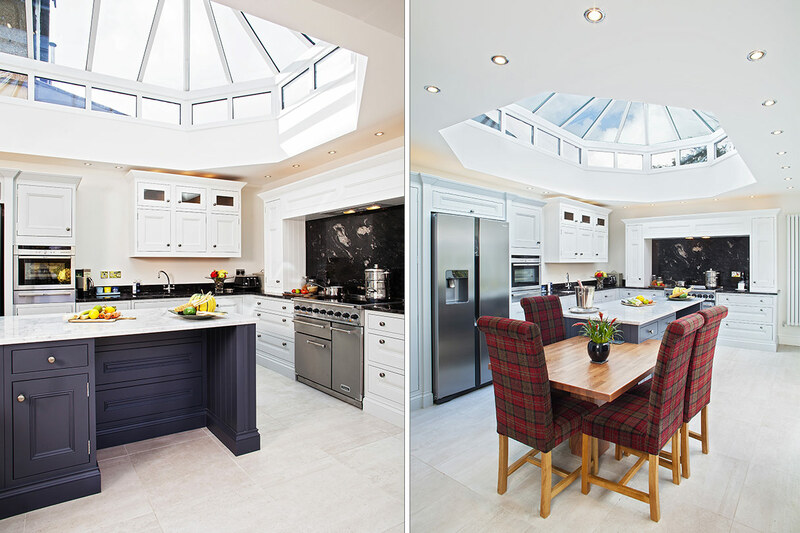 I also think the ‘fusion’ of traditional and contemporary kitchen styling hits the perfect balance between detail and simplicity”.